I presume you took them on, or near, Fern Ledge. Correct? If so, how was the trail to Fern Ledge? Did you find any spots of the trail tricky to navigate? And how many other hikers were on the trail? I presume that it wasn't too crowded at all, but one never knows. Incredible pictures. Is there an alcove behind the Falls? Looking over the "Death in Yosemite" book, Sunnyside Bench has caused its share of pain and broken bones. OK, a naive question since I've never been on Sunnyside Bench but is that what the guy in the 2nd photo is walking along? I've always been curious about this but the little bit I've found about it online makes it sound more like a climber's route than a hiker's route but at least the segment in the picture doesn't look that bad. Is it a big deal to get to that spot? Great images! I've considered trying this hike but it may be beyond what I care to attempt. I know the approximate route but I don't know exactly where it goes when you reach the end of Sunnyside Bench. In early June I went to Oh My Gosh point and took a large panorama which included what must be the route to Fern Ledge. Below are links to two images of the area, one small and one large. Would someone who knows the route be able to mark up one of the images in Photoshop or some other image editing program and post it? If you can't post, then you could PM me and I'll give you my e-mail address and I'll post it. From this view it looks too steep to hike but I guess you can. Warning: The large image expands to 130 MB. You can see some pretty fine detail on it though. Edited 2 time(s). Last edit at 08/01/2011 09:50AM by Calaveras. Speculation on my part since I haven't even been up Sunnyside yet. But this is they way I would go. It looks do-able. 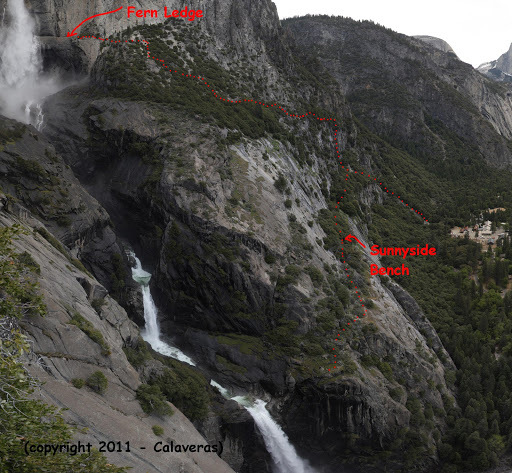 As I understand it, you have to go all the way across Sunnyside Bench trail and just before you're at the top of Lower Yosemite Fall, you head up. ryanmj?? you obviously made it up, can you describe how you got there and where you took off from Sunnyside Bench? Edited 2 time(s). Last edit at 07/21/2011 01:18PM by qumqats. I'm OK with that. I just looked at the picture and drew in what I thought was the route. I think I'll bring a rope when I do this... eventually. Im going to be there the first week of August, Pm me if you want me to take you up. I wouldnt take my kids on this, some slabs are covered with leaves and loose gravel, one slip and you gone. I found a description of the route here and a bunch of pictures on the trail here. Another description with some maps and a few more pix are here. Head up the rockpile behind the stables, stay to the left and soon a use trail appears. When you reach the bench, head west, turn a corner with one rock climbing move. Stay close to the edge; there are trails that head up into what looks like safer ground but they are dead ends. Follow the bench to the top of the lower fall, then hang a u-turn and up a short chimney with big holds. The trail reappears for a moment and then you hit these slabs, the crux of the climb. There are a couple ways through this section depending on how wet the rock is at the time. There's a bolt just above and to climber's left of my buddy if you want to protect this section. It's not so bad going up but a little trickier to down-climb. From there angle slightly to the right to a big bit of rock, when you get to the middle of it you'll find a crack that leads left, you should find a piece of tagging tape there. Easy sailing from there on. Edited 1 time(s). Last edit at 07/21/2011 05:11PM by QITNL. Thanks for all the input. After seeing the photo above of the guy hanging onto the slab, I know it's not for me. I'll leave it to the more adventurous types. After seeing the photo above of the guy hanging onto the slab, I know it's not for me. Um, yeah. I was getting really excited about this "hike" until I saw that pic. Breath taking... just afraid it could be breath-taking... literally! That's the fun part! I wasn't trying to scare you. Or was I? Maybe a little bit? Well, honestly my buddy was a little sketched on those slabs, and he's a "climber." I took my girlfriend there last spring and we hit our turn-around time after a couple of steps. I like going up there early in the year when the falls are roaring, you have more options later in the year when the granite isn't so wet. The slabs have some hummocks but continued use is pulling them off. Nonetheless, be careful and give the first half a shot. Peek-a-boo! Behind mule-ears, you see the use trail, you see the edge, just try to stay on the use trail and don't fall off the edge. Easy. Turn around if it gets too wet. One other caveat: there are a number of very popular rock climbs that top out across this trail - it's a climber's trail. Do your best not to trundle any rocks. If you knock rocks off this trail, you very well might kill someone who is climbing underneath you. If you dislodge a rock and it falls over the edge, at the very least, yell "ROCK!" at the top of your lungs. Serious. Like mine, your pictures won't do it justice, all the time you are getting some kind of spa treatment. From there, pull the u-turn, up the little chimney, check out the scary slabs. Your time won't be wasted and you're king of the tourons if you turn around right there. If you can make it to the upper falls, it's a Superblast! Edited 1 time(s). Last edit at 07/23/2011 02:18AM by QITNL. Recent Chron article on the Yosemite Falls of Muir. I presume the spot he found is now what is referred to as Fern Ledge and that he was not actually "behind" the falls? Just wanted to first thank you guys for having such an amazing site. I've learnt so much already about secret nooks and crannies in Yosemite. Speaking of secret nooks and crannies, I've wanted to hike to Fern Ledge for a long time. Unfortunately, Yosemite Explorer's website seems to be down, so I can't access any of his photographs as a guide. A number of other sites that I have seen have confused the hell out of me — does this hike require ropes/climbing experience? Or is there a route that does not require ropes/rapelling? It doesn't require a rope but there are stories where folks were glad they were tied into one. As I mentioned above, you may find a convenient bolt. I would say it takes climbing ability - particularly down-climbing experience. The jaunt out to the end of Sunnyside Bench is fun, just a little spice. Beyond that, you gotta get past 20-30 yards or so of third class/no falls allowed. Ah, drat. I am an experienced hiker, but not so much of an experienced climber. I wouldn't know how to tie myself in (how do you get to the bolt hole from below, etc). Apologies if this sounds base-level. The first guy has to climb it, and he can't fall. As well, a single bolt is not an ideal anchor. I'm not quite sure why it's there, it may be more for lowering stuff down. When you are scrambling around and hit a bolt you know somebody got serious at some point. None of us wants to give advice that gets someone over their head. Nor to discourage you. The best way to take it is one step at at time, whether you are on the path or off it. Sunnyside Bench, Sierra Point, there are lots of nice Valley scrambles. I haven't been to the Valley for a while, summer vacation is ending, but I imagine the Falls may still be too big to wander down from the westside? I don't have awesome photos like yours, but I took this video from on top of Upper Yosemite falls. It was neat to see where the water was being drained from and over the cliff. That's "Slacklining" (or in this particular case, "Highlining"